In February 2014 two divers died at a depth of more than 100m in a huge cave system in Norway. The authorities said it was too dangerous to retrieve their bodies, but four friends of the men decided to take the risk - and seven weeks later they descended into the dark and glacial waters. At the end of the Plurdalen valley in central Norway a 35m-wide river rises abruptly out of the ground. If you dive into this strange pond, known as Plura, and swim underground for half a kilometre, you will emerge into a long, colourful cave. Diving hobbyists can climb out of the water here to admire the grotto, before returning to Plura. But if you are highly trained and experienced - and an insatiably curious individual - you might continue on a course that quickly plunges much deeper, becoming narrow and difficult, through ice-cold, pitch-black water. After negotiating this "sump" - an underground pocket of water - you will finally ascend to the cave of Steinugleflaget. And about 90m above the cave's vaulted ceiling lies your exit - a crack in the collapsed side of a hill. On 6 February 2014, two divers cut a triangular hole in the ice at Plura, and, encased in waterproof dry suits and diving equipment, slipped into the water. Two hours later, after the sediment raised by the first divers had been allowed to settle, three of their friends followed behind. The destination for all five men was Steinugleflaget. They were Finnish divers who knew one another from explorations they had made of the Ojamo mine, west of Helsinki. As was the custom of the group, no-one was in overall command, but the first diver to set off was Patrik Gronqvist, one of a trio of Finns who had discovered the passage between the caves the year before. He was diving with his good friend Jari Huotarinen, who was attempting the traverse for the first time. The trip was at the extreme end of a dangerous sport. While most amateur divers might restrict themselves to dives of between 30 minutes and an hour, at a depth of 30m or so, the trip to Steinugleflaget would be a five-hour dive, with the aid of underwater scooters, to depths of more than 130m. "The deeper part is very demanding, very cold water and narrow tunnels, and deep as well - it is the world's deepest sump that has been dived through," says Gronqvist. At such depths and temperatures, a tear in a dry suit on the sharp cave floor could result in death. There is also the possibility of equipment failure, and hypercapnia - carbon dioxide poisoning. "Carbon dioxide absorbs into the bloodstream much faster and easier at depth," says Gronqvist. Cave divers use "rebreathers" which artificially absorb the carbon dioxide they exhale, but these can become overloaded if the divers start breathing quickly, and at depth it is more difficult for them to control their breathing. "If you have to do anything physical - swim harder or faster or anything - that's very dangerous," says Gronqvist. Hypercapnia can be deadly, but even a mild case may cause confusion and disorientation, which in a deep cave is liable to have serious consequences. About an hour into the dive, shortly after the pair had swum through the deepest section and were about 110m lower than the cave entrance at Plura, Gronqvist realised that Huotarinen was not behind him. He went back and found his friend had become stuck in a narrow section of the cave, entangled in a cord connected to a piece of his equipment. He was using his torch to signal distress. Huotarinen seemed to be starting to panic, which meant he risked breathing too fast. Gronqvist gave him a cylinder of gas to reduce the amount of carbon dioxide in his system, but while Huotarinen was switching mouthpieces, he started helplessly swallowing water. To Gronqvist's horror, his friend died in front of his eyes - but getting agitated would put Gronqvist himself at risk of hypercapnia. After a brief effort to free the body, he forced himself to calm down. There was nothing for it but to continue to Steinugleflaget - very slowly. Divers who have spent time in deep water cannot go straight to the surface because of the risk of decompression sickness, another potentially fatal hazard. The deeper the dive, the longer the decompression. Because he had stopped to help his friend, spending about 20 minutes at a depth of 110m, Gronqvist knew he would have to spend hours making additional decompression stops before surfacing. He also knew that at some point the second group of divers would find Huotarinen's body blocking their way. The first diver in the second team was Vesa Rantanen. "I got to that narrow place, where that first diver got stuck, and I had to decide what to do," he recalls. "My options were to try to pass that dead diver, or to turn around and try to do a very long dive back, go back to the deepest section and try to survive to the surface. "I decided to go forward, and that was a very good decision for me. But it took me at least 15 minutes to get past that dead diver." He eventually met up with Gronqvist, but Rantanen's struggle to pass Huotarinen's body had added three hours to his decompression time. Because he began to run low on gas he was forced to surface 80 minutes early. Soon afterwards, he began to suffer mild pains in his knees and elbows. These symptoms of decompression sickness - often called "the bends" - grew steadily more serious over the following hours. Rantanen later found out that while he had been struggling to pass Huotarinen's body, the diver behind him, Jari Uusimaki, was also running into difficulties. Norwegian police believe Uusimaki panicked after he reached the scene of the first accident. The fifth and final diver, Kai Kankanen, tried unsuccessfully to come to Uusimaki's aid. In interviews, Kankanen has said his memories of exactly what happened are sketchy (he was unavailable to contribute to this article). But unlike Vesa Rantanen, Kankanen decided not to push through to Steinugleflaget. Instead he turned around and swam the long way back to the starting point. He finally emerged from the cave in the early hours of the next day, more than 11 hours after setting off on a dive that was supposed to take five hours. By the time he reached Plura, he had to break a thin layer of ice to climb out of the water. The three survivors were all hospitalised with decompression sickness. The Norwegian authorities took statements from them and closed the Plura cave. In the cave-diving world, discovering how caves are linked together is a weighty achievement, one of the ultimate goals of the whole sport. When Gronqvist had made his original traverse of the Plura caves in 2013, he had done it with Kai Kankanen, and a third team member, Sami Paakkarinen. Equipped with a dry sense of humour and a passing physical resemblance to Hollywood tough guy Vin Diesel, Paakkarinen had been diving longer than any of the others. At the time of the accident he was teaching a diving course in Mexico. "When you wake up and you see that there are 10 missed calls and 10 messages on the phone, you know immediately that something is wrong," he says. Paakkarinen spoke to the three survivors on the phone from hospital, then spent the day walking around his hotel courtyard. He had trained both the victims and counted them as good friends. He felt unable to go in the water to teach, but he was unsure what he could usefully do. Eventually he fielded a Skype call from the British cave diver Rick Stanton. World-renowned for his rescue and recovery work in caves, Stanton had a feeling he would be asked to travel to Plurdalen to retrieve the bodies - he had done a recovery there in 2006 - and had already started to find out what he could. Sure enough, before long Stanton received a request for help from the Norwegian police, and two weeks later, he and two other British divers, John Volanthen and Jason Mallinson, clambered into Steinugleflaget. But when they dived down to survey the site of Huotarinen's accident, they discovered that he could not be readily freed from the Steinugleflaget side, and he blocked access to the second victim, Uusimaki. "It was evident that it was going to be quite a protracted affair, lots of dives, down deep and cold - and that was really beyond our remit," says Stanton. The only alternative was to perform the traverse from Plura all over again, and thus gain access to the victims from the other side. Stanton says that he and his fellow divers considered it, and decided it was too risky. So the Norwegian police called off the recovery. At that point Gronqvist, a firefighter by trade, made Jari Huotarinen's wife a promise. "I told the widow that we would go and get them," he recalls. "I told her that they are not going to be left there, that we would think of something." Having the bodies would help the families grieve, and would also help to prevent lengthy delays to insurance and inheritance settlements. He soon discovered his friends had all had the same idea. "Everyone was waiting for the SMS," he says. All three survivors would be involved, plus Paakkarinen. It's well known that some of the world's most challenging peaks are dotted with the remains of mountaineers whose bodies could not be safely retrieved. But Paakkarinen says that leaving bodies in the Norwegian cave would have been like leaving victims of a car crash by the side of the road. "It's a code that no-one is left behind," he says. "You always have to do your best to get your friends out, wherever they are." He and his friends also knew that there was a chance that part of northern Europe's biggest wet cave system would remain closed to the sport forever if they failed. But the mission had to be planned in secret. If they asked the Norwegian police for permission, it was certain to be refused. They had a distinct advantage over the British rescue team - they had performed the traverse before, so felt confident they could reach the bodies from the Plura side, cut Huotarinen's body free and guide both of them to the surface. "I don't say that there was no risk to us," says Paakkarinen. "Quite the opposite, it is one of the most challenging dives that you can do, this Plura traverse. But then again, we have the best knowledge of the place, we are the original explorers of the place, we know the place like our own pockets." But this advantage was offset by the fact that the men knew the victims they would be rescuing. How would they react when they came to the site of the accident, and had to handle their corpses? Would they become upset and breathe more quickly, or make a silly mistake that could lead to another tragedy? For this reason, Paakkarinen says they tried to process "all the emotional stuff" in the month leading up to the rescue, so that when the time came they could focus on the task in hand, working almost like robots. A new documentary, currently on release in Finland, depicts what happened. In Diving into the Unknown, we do not see any of the divers collapsing into tears, or talking emotionally about lost friends. Instead, the atmosphere is one of intense single-mindedness, as the team discuss how to manoeuvre the bodies through the water, and preserve them until the police, notified after the fact, could come and collect them. In all, a team of 27 people descended on Plurdalen on 22 March 2014 - 17 Finns and 10 Norwegians. Two teams of support divers would work at shallower levels at both ends of the traverse, while Gronqvist, Paakkarinen and Kankanen would dive once again to the deepest section of the cave to raise the bodies up. Vesa Rantanen, who was still recovering from a spinal injury caused by his decompression sickness, would be surface manager. This time they took no chances. The first step in the five-day operation was to lug more than a tonne of gear into the cave at Steinugleflaget, winching it bit by bit up a cable to the mountain. Then they spent a day setting up equipment, leaving 50 cylinders of gas along the route and, on the Plura side, an underwater habitat. This is a pocket of air that divers can use during decompression stops, allowing them to get out of the cold water, remove their masks and even eat. If the divers found Huotarinen's body impossible to shift, they would have to make the long trip back to Plura, and such a device might well be a life-saver. On the third day, 24 March, the divers began the recovery itself, slipping once again beneath the icy lid of Plura, accompanied by underwater camera operators. But after descending about 85m Kankanen returned. Looking upset, he explains in the film that he slept badly and is simply not in the right frame of mind for the operation. Paakkarinen and Gronqvist continue the descent alone. In gripping footage, the divers' torches catch the jagged edges of the cave walls. We hear the clanking of their gas cylinders and the intermittent whirring of underwater scooters. The men's breathing, the bubbles released from their equipment, and the occasional muffled command complete the soundtrack. They pass the floating body of Jari Uusimaki. Then, just 20m or so further on they encounter Jari Huotarinen, exactly as Gronqvist had left him seven weeks earlier. Cutting his equipment away, they manage to release the body and negotiate it through the narrow part of the cave. Then Gronqvist steers a dive scooter towards the surface, towing the body, while Paakkarinen follows to help manouevre it. Gronqvist is the first to surface, eventually, in Steinugleflaget, where Vesa Rantanen is waiting to greet him. "I've been thinking about this every single night since I walked out of here," Gronqvist says evenly. "Last time I didn't know whether to come back up or stay down there," he adds, hinting at what Huotarinen's death has cost him. "If we had done a practice run then, things would have been different. It was totally our own fault." Cave divers the world over need to have remarkable self-command, but Diving into the Unknown can be seen as a study in a character trait beloved of Finns - sisu, grit in the face of adversity. The film's director, Juan Reina, laughingly agrees that there is little in his film to contradict the national reputation for cool-headed composure. Finns also have a proud history of going to great lengths to retrieve the bodies of deceased friends. The phrase "kaveria ei jateta" - "never leave a friend behind" - was used by Finnish soldiers, who put themselves in grave danger to recover the bodies of fallen comrades during the Winter War against the USSR in 1939-1940. The following day Gronqvist and Paakkarinen returned to retrieve Jari Uusimaki's body, assisted at depth by another diver, Jani Santala. This time the team launched their recovery from Steinugleflaget. It proved a more difficult day than they anticipated. This body was more buoyant and unwieldy than the first, and Paakkarinen came close to disaster when a part of the cave collapsed on him. At last, though, both victims were lifted up to Steinugleflaget, where they were placed in body bags Gronqvist had taken from his fire station. The whole operation had taken 101 hours of diving time. The group held a moment's silence in the beautiful cave. The following afternoon they went to the local police station. Paakkarinen says that he sensed the Norwegian police were pleased that they had recovered the bodies, but "they let us know that we had broken some rules and they had to investigate that". It was another six months before the group was told that they would face no charges for their illegal dive. The Finnish president awarded Gronqvist the First Class Medal of the White Rose of Finland, after he was nominated by his colleagues in the fire service. 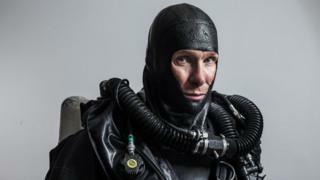 For Rick Stanton, the British diver from the first, aborted, recovery mission, the Finns' effort was well-planned and executed, if "a little bit out-there in terms of danger". But he remains troubled by the events in the Plurdalen valley. "This incident happened, and then they've made a film and they all come out as heroes," he says. "But these two people should never have died in the first place." He says that while people who have never been cave diving might think it's so dangerous that a few people will inevitably die, with proper training and planning, accidents such as this should never happen to experienced divers. Despite everything, Gronqvist, Rantanen, Kankanen and Paakkarinen continue to enjoy the sport. "Why do these guys who have families and everything, why do they go to these harsh places?" asks Juan Reina. "It's not that they are just enjoying the thrill of risking their lives - there's more to it than that. It's their calling. "It is very easy to judge them if you have never explored that world, if you've never been on the journey with them. That's why I wanted to take the viewers on that journey. Although there are two victims here, and a sad accident has happened - when you go through this journey with them, I hope people understand why they do this." The Plura caves are now open once again. Nobody has made a new attempt at the traverse, but Sami Paakkarinen says for him it's only a matter of time. "There are lots of questions - the original questions - about where the cave goes, and where the water comes from, and they are still there," he says. "And I am not afraid of the cave."